I am excited to announce a new Voice Simulator that you can use to create SSML (Speech Synthesis Markup Language) without having to make calls to your Alexa skill or the need for an Alexa device. This new tool will let you experiment with SSML speech tags and then immediately hear how Alexa will say them. In addition, we have updated the Service Simulator tool to let Alexa speak responses from your skill directly within the console. We are also adding four new built-in intents for use within your own skills: Yes, No, Repeat and StartOver. These new intents will enable you to control how Alexa responds to customers requesting that she repeat or start over an action as well as a standard way to respond to questions that require a yes or no answer. When creating SSML for use in your own Alexa skill responses, you may find the need to experiment with certain tags. For example, having to decide if Alexa should pause for one second or three seconds when using a <break> tag is best tested within actual voice utterances and conversation. 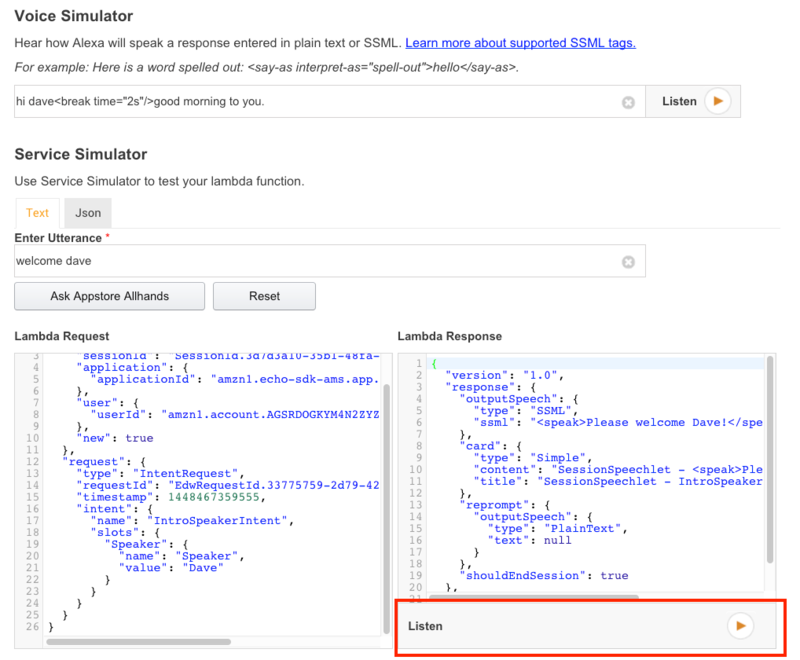 The new Voice Simulator tool will let you create SSML on the fly and then have Alexa respond. To use the Voice Simulator, click on the Test tab while editing your Skill in the developer portal and you will notice a new Voice Simulator section at the top. Simply enter the text you want to hear in the Voice Simulator text box, then click Listen. Once you click Listen, you will immediately hear Alexa respond using the provided SSML. Please note <speak> tags are not required but will be accepted if you choose to use them. You can also enter plain text if you want to hear how Alexa would pronounce something. The Voice Simulator does not interact with the service for your skill, so you can use it to hear text-to-speech conversion before you have completed the minimum configuration for your skill. For instance, you can experiment with the SSML output you intend to use for your skill before completing the Interaction Model. The Voice Simulator supports all Alexa SSML tags except for the <audio> element. In addition, we have updated the Service Simulator to enable Alexa to speak your skill’s response. When you receive a response from your Alexa skill you will notice a new Listen play button at the bottom of the response window. Simply click the button to hear Alexa speak the response. In the above example I am returning SSML as the outputSpeech and Alexa will utter what is said in the SSML tag. The Alexa Skills Kit provides a collection of built-in intents. These are intents for very common actions that you can choose to implement without providing any sample utterances. For example, the built-in AMAZON.HelpIntent is automatically mapped to common ways of requesting help from a skill. If you choose to use this intent, users can invoke your skill, say something like “help”, and the Alexa service sends your service an IntentRequest for the AMAZON.HelpIntent. Your service can handle this intent in a way appropriate for your skill. Built-in intents save you the trouble of having to write multiple sample utterances for the intent and give your skill a consistent, common way to work with. Provide help about how to use the skill. See “Offer Help for Complex Skills” in the Voice Design Best Practices for guidelines about help text. Let the user request to restart an action, such as restarting a game or a transaction. For more information about implementing Built-in Intents into your own skil,l check out the Implementing the Built-in Intents walkthrough on the developer portal. Ready to Get Started with Your Own Alexa Skill?